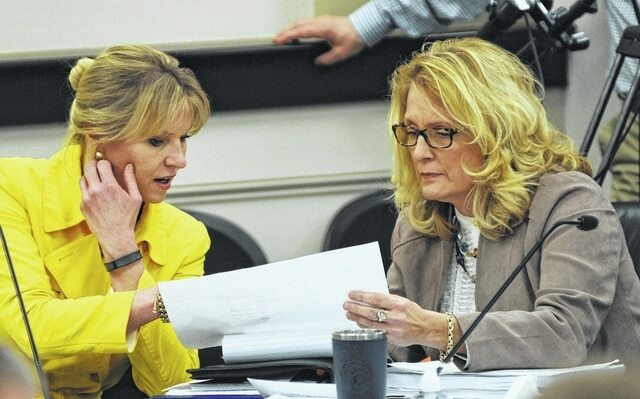 Senator Robin Webb, D-Grayson, (right) confers with Laurie Dudgeon, director of Administrative Office of the Courts, during the budget conference committee meetings this week in Frankfort. Senator Webb was selected by the Senate Majority Leadership to serve on the committee to iron out the differences in the Senate and House spending proposals. Senator Webb has worked on numerous budgets as a member of the Senate Appropriations and Revenue Committee and as former vice chair of the House budget committees.